The earliest known record of the genus Homo — the human genus — represented by a lower jaw with teeth, recently found in the Afar region of Ethiopia, dates to between 2.8 and 2.75 million years ago, according to an international team of geoscientists and anthropologists. They also dated other fossils to between 2.84 and 2.58 million years ago, which helped reconstruct the environment in which the individual lived. 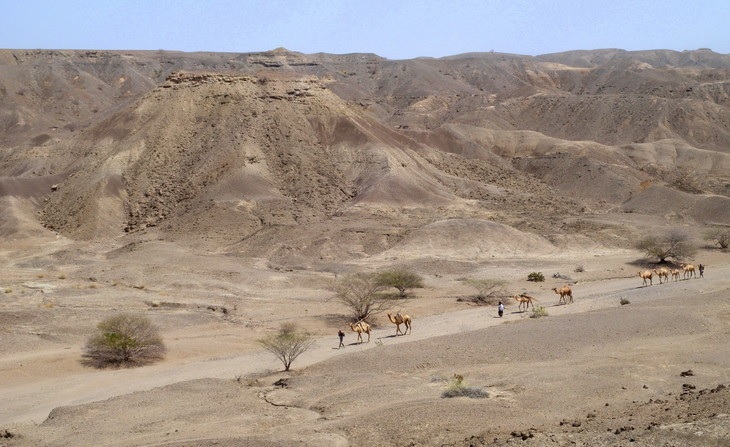 “The record of hominin evolution between 3 and 2.5 million years ago is poorly documented in surface outcrops, particularly in Afar, Ethiopia,” said Erin N. DiMaggio, research associate in the department of geosciences, Penn State. Hominins are the group of primates that include Homo sapiens — humans — and their ancestors. The term is used for the branch of the human evolutionary line that exists after the split from chimpanzees. Directly dating fossils this old is impossible, so geologists use a variety of methods to date the layers of rock in which the fossils are found. The researchers dated the recently discovered Ledi-Geraru fossil mandible, known by its catalog number LD 350-1, by dating various layers of volcanic ash or tuff using argon40 argon39 dating, a method that measures the different isotopes of argon and determines the age of the eruption that created the sample. They present their results in today’s (Mar. 4) online issue of Science Express. The fossils suggest that the area was a more open habitat of mixed grasslands and shrub lands with a gallery forest — trees lining rivers or wetlands. The landscape was probably similar to African locations like the Serengeti Plains or the Kalahari. Some researchers suggest that global climate change intensifying roughly 2.8 million years ago resulted in African climate variability and aridity and this spurred evolutionary changes in many mammal lines.